How the Swedish Migration Board used Qlik to analyze countrywide insights. Analysera: the Swedish word for analyze. Even if you don’t speak the language natively, you have a pretty good idea that is how the word translates into English. Knowing the definition of the word is far different from managing the process itself. To analyze a subject properly it requires a well-rounded knowledge of your subject matter and a well-coordinated effort to collect relevant data. That data can reside on various systems in various locations – but something has to bring it all together into meaningful insights at the point of decision. This is where the story of the Swedish Migration Board’s (Migrationsverket) analysis begins. Sweden has a long history of immigration, starting as far back as World War II when refugees entered the country seeking asylum from war-torn countries in Europe. This trend continued in the 1980s and 1990s as conflicts ensued in Bosnia, Iran, Iraq and the Balkans with thousands of refugees seeking asylum in Sweden. More Europeans continued to immigrate through the 2000s and now as of 2014, 16% of Swedes were born in another country according to Statistics Sweden. The Migration Board felt that many of their efforts, nationwide, could be better coordinated and integrated to provide more effective analysis. They needed a solution to display information and easily visualize the data. Something that could provide a comprehensive overview but was easy to extract information from to assess individual cases. It should come as no surprise that a company with Swedish roots came to the rescue. Qlik was brought in by Andres Delgado to spearhead the change process within the Migration Board. Just from building a few dashboards, new insights were revealed. They could now view year-over-year comparisons of immigration data, average wait times for each applicant and in what regions these cases were processed. This new level of analysis allows the Migration Board to plan more effectively. 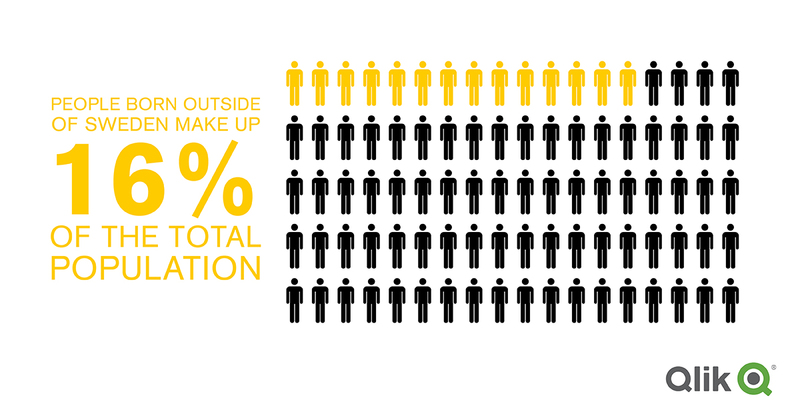 One large issue in recent years facing the department were the housing needs of the prospective citizens. Previously the Migration Board was unable to accurately predict the individuals seeking housing in each region of Sweden. Using Qlik and visualizing the number of individuals on a nationwide map, the Migration Board was able to decrease the wait times for housing and subsequently save funds allocated to helping the immigrants find housing. This is just one efficiency example, but the key benefit to implementing Qlik was the creation of a case management process within the agency. Previously, the only data that was being tracked were incoming and completed cases. But now every regional office and each user could see the supply chain from every angle: from the initial application being filed to the first stamp on the visa. Now that the Migration Board knows where there are busy areas in the process they can deploy resources to clear the bottleneck. That’s the power of analysis. 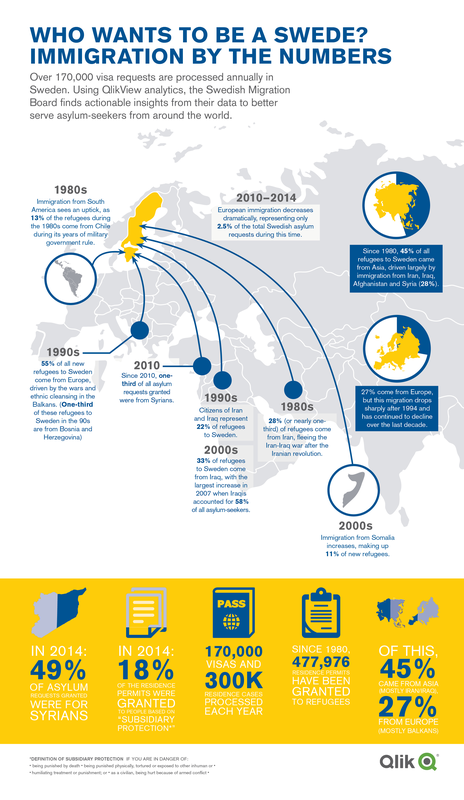 For a high resolution version of the Swedish Migration infographic below, click here to download.